Kiev was playing a game of soccer with his friends when they stumbled upon a mysterious relic that was shaped like an egg. The egg had a strange message about brave knights on it, so Kiev decided to take a closer look so that he could read the message. But, the moment he was done reading the message, Kiev's world got turned upside down. After traveling through a wormhole, Kiev woke up to a whole new world. Upon awakening, Kiev immediately noticed that the egg he was reading just moments ago looked different. Instead of looking old and tarnished, the relic looks shiny and new. Just when Kiev was ready to abandon this bizarre relic, the relic activated, turning Kiev into one of the pure knights he read about in the message. Now it's up to you to use Kiev's new powers to fight evil and uncover the story behind the strange egg in this fun online hero game for kids! 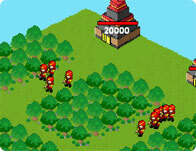 Follow the in-game instructions and use your mouse to fight evil!